Little of what we claim today as natural wonders will be here in a hundred years time. Little is today as it was a century ago. 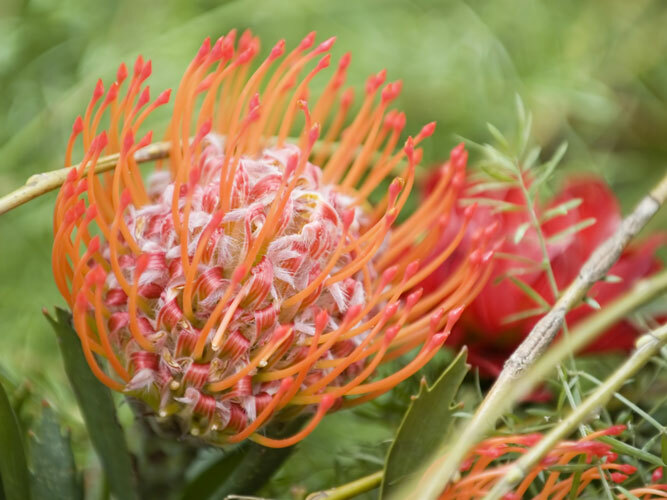 The Cape Floral Kingdom is at once the smallest of the world’s six floral kingdoms, and its richest. It covers only 18 000 square kilometres in a narrow stretch of land that runs parallel to the coast from the Olifants River, near Vanrhynsdorp, to the Eastern Cape, containing some 8 500 species of flowering plants and ferns. The coastal plains of northern Zululand extend 250 kilometers southward from the Maputo River floodplain to Lake St Lucia. 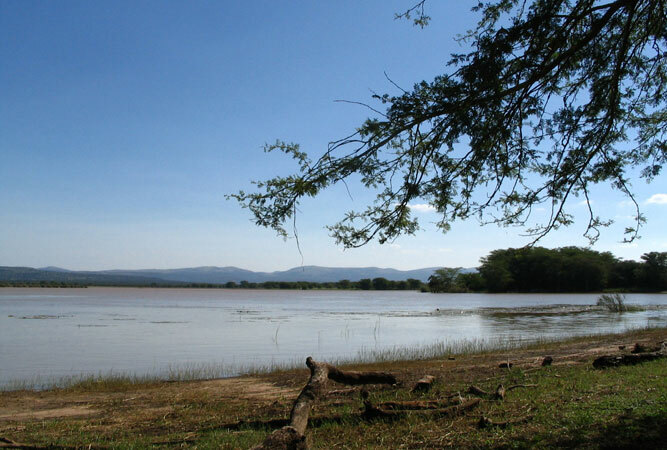 From the west, four main rivers cut through the Lebombo Mountains down to the plain. In the east large lakes and lagoons are separated from the sea by huge sand dunes. The vleis and marshes that line the floodplains of the rivers are riddled with crocodile and hippo. The rains from October to March mean that streams pour into swamps and pans, creating wide lakes into which floodwaters of rivers spill. The Kosi system is a tidal basin and four lakes with channels that connect them to one another and the sea. Mangroves grow in estuaries along the coast but at Kosi estuary they become thick woodland that includes all the mangrove species of southern Africa. This whole coastline is a natural wonderland. 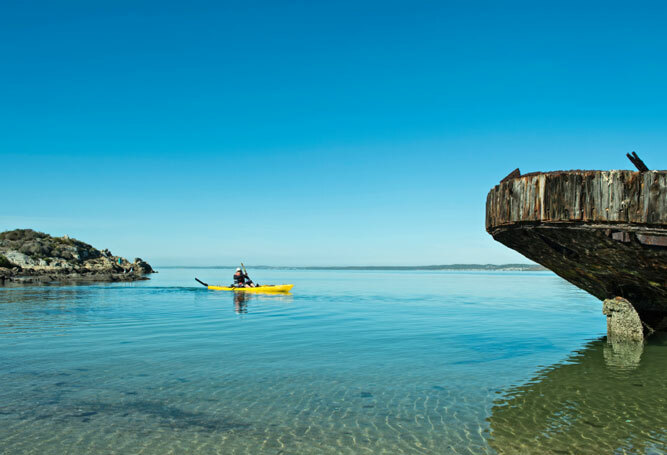 Langebaan Lagoon extends in a finger of water away from Saldanha Bay, its 16 kilometres controlled by tidal currents, tailing off into salt marshes and a cluster of salt pans, rich with water bird life. Saldaha Bay is the most prolific source of fossils thus far uncovered anywhere in Africa – bones speak of another world in which there were both fresh water animals and land animals like giant otters, giant pandas, short-necked giraffes and sabre-toothed cats, a rhino from which the white rhino is descended and the ‘true elephant’, an ancestor of the woolly mammoth. 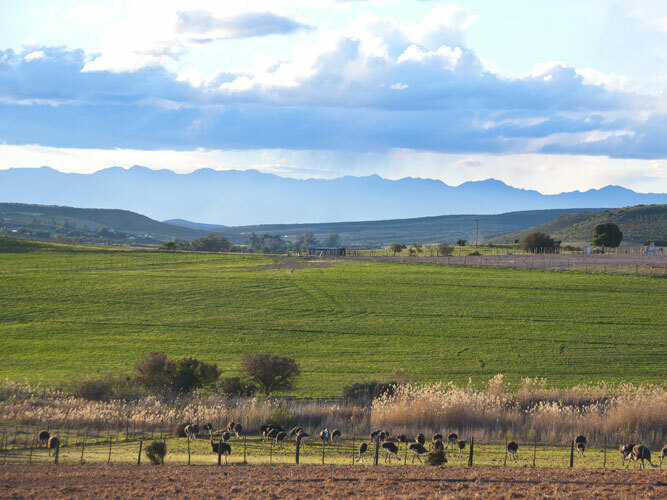 Covering 33 square kilometres, Paarl Mountain is the most southerly remnant of a series of Cape Granite igneous rock, part of a range of hills that stretch from St Helena Bay to the Drakenstein Valley. 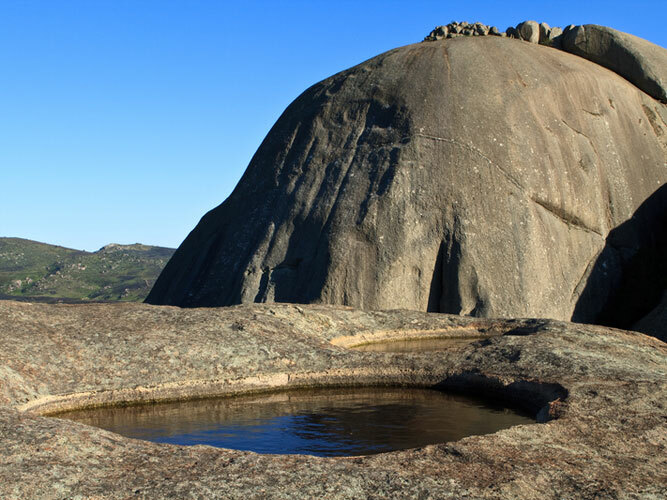 The two domes were formed about 600 million years ago but were embedded in a mass of Malmesbury rock that gradually eroded away, leaving the tops of the boulders exposed. Then 150 million years later the surface was covered over by sedimentary rock. Gradual weathering has exposed and fashioned the two rounded boulders that today distinguish the town of Paarl at the foot of the mountain. 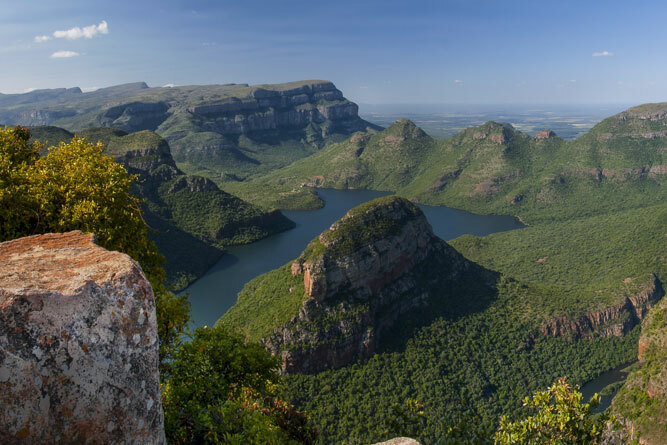 The only true canyon in South Africa, the Blyde River Canyon follows the Blyde River as it cuts its way through the massive escarpment and plummets over 1000 metres from the highlands of the Drakensberg to the Lowveld below, dominated by huge quartzite krantzes and summits like the Three Rondavels. Its drama draws countless visitors each year. 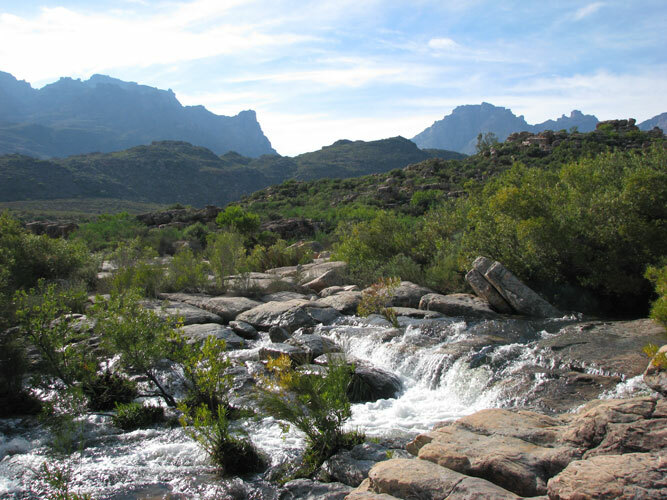 The Cederberg mountain wilderness is a range of rugged peaks and ridges gouged by wind and rain into outlandish shapes, accompanied by deep valleys with pools and waterfalls spanning 700 square kilometrres. From the lofty peaks of Krakadouw and Middelberg to the Stadsaal Caves, grotesquely hewn by rain and running water in sandstone, there is evidence of the ease with which upper sandstone relents to weather, resulting in places in surrealistically carved pillars and sculptured columns; the natural sandstone arch of the Wolfberg and the Wolfberg Cracks – deep chasms through the sandstone. Breathtaking views and scenes of earthly paradise await hikers. This massive ‘wall’ rises as if out of nowhere; the Amphitheatre a fortress of inaccessibility. The remote summit remains a silent world, spared the ravages of human development. 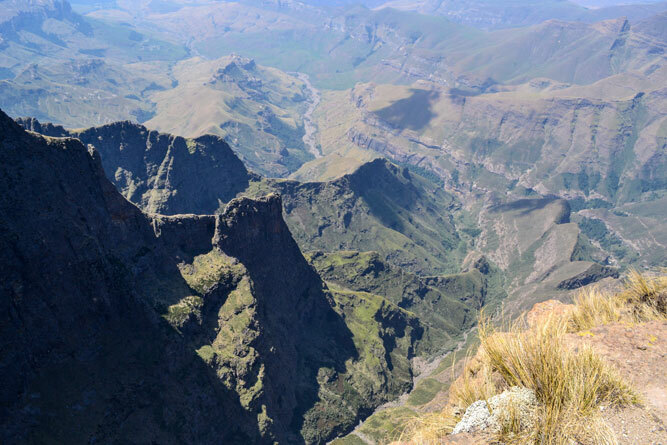 Little, when compared to the wide plains of the Great Karoo beyond the mountains, the Little Karoo lies sandwiched between two huge ranges of folded mountains that run west to east across the southern Cape. In the foothills of the Swartberg is the Cango fault and showpiece of the Little Karoo – the Cango Caves. Created by the same process that hollowed out the Sterkfontein and cave systems in Gauteng, the caves are of the world’s most extensive and beautiful dripstone collections in a labyrinth of connected gaping halls, chambers, galleries, catacombs, passages and crawlways. 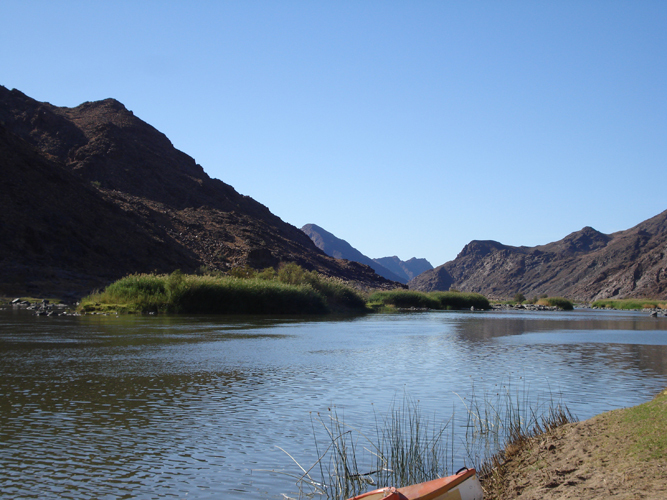 For millions of years diamonds have been carried to the Atlantic by the Orange River, creating one of the richest alluvial diamond fields in the world on the West Coast. The river rises near Mont-aux-Sources and flows 2 000 kilometres across the country, traversing major rock formations, carving deep gorges and canyons in old granite and ancient quartzites, defying gravity down waterfalls, and flooding plains used for farming, en route. 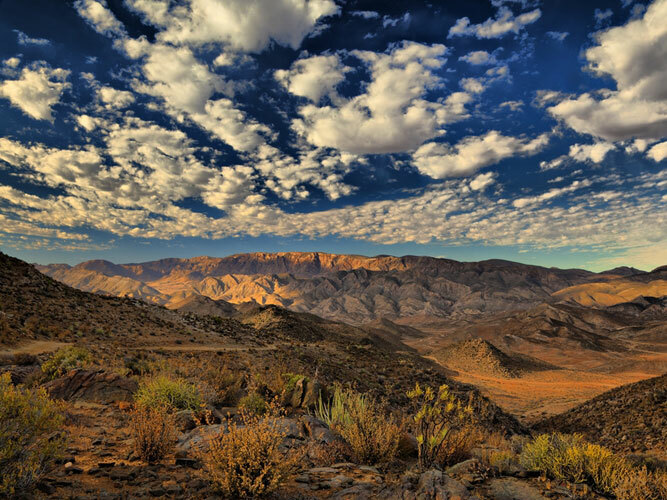 Lying inland from the coast between the mouth of the Orange River and Port Nolloth, the area regarded as the Richtersveld is 8 000 square kilometres of coastal plain and sandveld, to the east of which lies the true Richtersveld – 3 000 square kilometres of geologically complex desert mountainland. Scant rainfall, no permanent water source, tiny stone plants found nowhere else, the unusual halfmens, and spring daisies that defy the barren rock and stone are the hallmarks of this barren beauty.